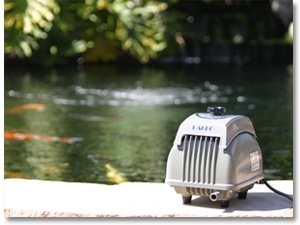 Obviously, Hakko Air Pumps are perfect for Koi ponds and water gardens. The high volumes of air given with such low energy consumption makes Hakko very attractive. The proven long term reliablity sets a new standard for the safety and well being of your pond fish. An experienced Koi hobbysit will always have a double aeration backup for the pond. Your waterfall pump provides one source of aeration but if it fails your Hakko aeration system is there to keep your fish alive. A Koi pond is more than a hole in the ground with a liner and some water. In order to have a healthy, dynamic pond environment you also need a biological filter, a source of aeration, a circulation pump and adequate space, or volume. It is important to note that all of these elements must work in harmony with one another. The filtration system purifies the water of wastes, bacteria and other toxins. An aerator supplies air to the water so the fish will have oxygen and the water does not stagnate. The pump moves the water through the filter and aerator. This cycle is the lifeblood of a pond. Water ponds, fish and oxygen ... the big secret to Koi fish keeping. We survive on this earth because we can breathe oxygen. Koi need oxygen and the beneficial bacteria that keep the water healthy need oxygen.